TRENTON, N.J. - Feb. 1, 2017 - PRLog -- Seven13 films and Lawrence-based PEI Kids have partnered to produce a documentary film, PEI Kids: Generation Change, moderated by Adrienne Bankert, National Correspondent, ABC News and taped at the Sam Naples Community Center in Trenton. 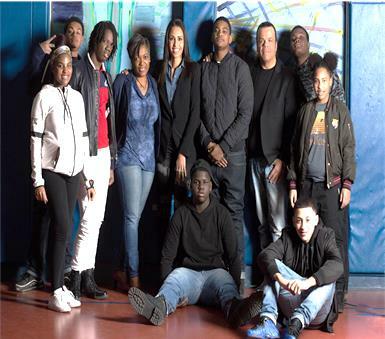 April 2nd at the Garden State Film Festival, interviews adjudicated and at-risk Trenton city youth focusing on how they would solve current problems in their community such as building positive relationships with law enforcement and local government. PEI Kids' mission is dedicated to promoting and maintaining a safe environment for all children. Juvenile Intervention Services Coordinator, Rob Fiorello says of the project, "I welcome opportunities that give our youth a platform to share their voice and tell their story. " The agency's Juvenile Intervention programs work with first-and second-time juvenile offenders and youth at-risk of juvenile justice involvement, helping them change the trajectory of their lives. Executive Director Roz Dashiell explains, "It is important that our young people have a seat at the table for these discussions because with their insight, we can start to consider the appropriate point of entry to bring healing around some of the issues that fracture our community." Seven13 films creates projects that provide positive messages and ignite discussions on social issues. "This project is important on several levels," said Lee Kolinsky, co-owner of seven13 films. "It recognizes the challenges of youth who want to make a positive impact in their neighborhood, reveals the daily perception of their environments and seeks to offer insight on how the community can get involved." Seven13 films develops productions that actively include the involvement of those in the community who want to be a part of the filmmaking process. The company also plans to bring in local businesses and law enforcement agencies to help support an environment that strengthens bonds for a positive future. "The idea is to inspire young people to seek out the art of filmmaking by exposing them to the process right in their own back yard," said Joseph A. Halsey, co-owner of seven13 films. "We are hoping to bring the filming process into areas where film companies typically don't operate." The world premiere of PEI Kids: Generation Change takes place at the Garden State Film Festival on Sunday, April 2, at Dante Hall Theater, 14 N. Mississippi Ave. Atlantic City, NJ . Since 1985, PEI Kids' mission is dedicated to promoting and maintaining a safe environment for all children by providing prevention education and intervention programs relating to personal safety, sexual abuse, bullying, delinquency, and the overall well-being of the child. Currently serving approximately 12,000 children and families annually, PEI Kids is a 501 (c) 3 nonprofit which provides school-based prevention programs reaching over 10,000 students, teachers and parents. PEI Kids' intervention services, which serve approximately 2,000 children and family members, include crisis counseling for child victims of sexual abuse, anger management for youth at risk of juvenile justice involvement, and juvenile offender diversion programming for adjudicated youth. PEI Kids also provides support services for children in foster care and their families. To learn more about PEI Kids, please call 609-695-3739 or visit www.peikids.org.